Bring more to the table! 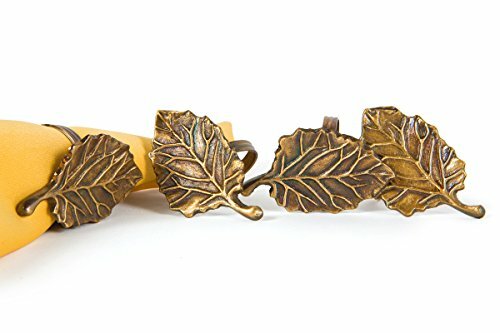 an intricate bronzed leaf adorns these durable metal napkin rings, letting you serve beauty with every holiday meal. As your definitive home décor destination, Manor Luxe feels that every day should be lived fashionably! Our distinctive designs, rich details, and tempting accessories are sure to endlessly fulfill your home’s finicky fashion sense. Whether you are keeping up with the ever changing colors of the holidays and seasons, looking for a stunning piece to tie your existing interior décor together while staying in tune with your individual style, or simply in need of an easy care focal point for an upcoming party or event, Manor Luxe has stylish creations that will complete your look and win complements at your next gathering! These warm and inviting table top accessories add the perfect accent to your fall and Thanksgiving gatherings! If you have any questions about this product by Manor Luxe, contact us by completing and submitting the form below. If you are looking for a specif part number, please include it with your message.